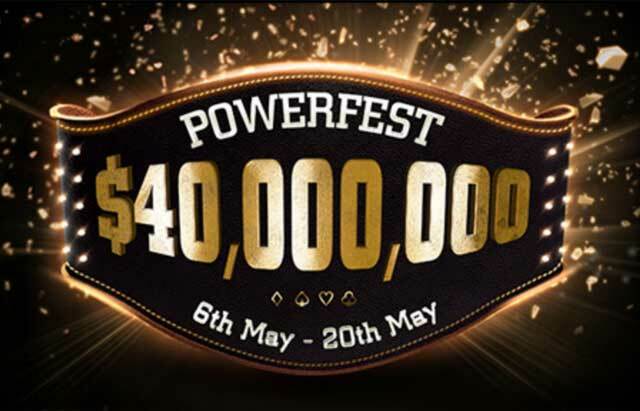 partypoker's POWERFEST returns on May 6 with $40,000,000 in guarantees. From May 6-20 partypoker’s online mega-series POWERFEST returns and, by all accounts, it’s primed to be the biggest yet. The two-week series is scheduled to have a massive 366 events and $40,000,000 total guaranteed prize pool, the largest ever series prize pool ever offered by the online site. “I don’t know who keeps coming up with these insane guarantees but it sure is a great time to be playing with partypoker,” said partypoker ambassador and popular high-stakes regular Jason Koon. Of the 366 events, 13 of them will carry a $1 million guaranteed prize pool, ensuring that plenty of players will have the opportunity at six-figure scores. Another partypoker ambassador, Patrick ‘pleno1’ Leonard (currently ranked #23 in the PocketFives.com Worldwide Rankings) has been extremely hands-on when it comes to crafting the upcoming schedule for POWERFEST and according to him, there’s going to plenty for everyone to play for. Part of the new ALL-IN movement for partypoker has been to push the boundaries of their guarantees in both their live and online events. The previous POWERFEST online series promised $15,000,000 in prize pools while the current partypoker LIVE Season One Grand Final in Barcelona offered €23,000,000 in total guarantees. As the partypoker events get more popular, the guarantees seem to only be growing. “These guarantees both live and online are huge and I can’t wait to play every day of both! With this being the largest POWERFEST on partypoker I am proud to be associated with a company who just keep making things bigger and better for the players,” said Sam Trickett, another member of Team partypoker. Players can be sure that with so much money up for grabs partypoker will be offering a number of satellites and phase tournaments to help players find their way into as many events as possible.